When Peter Politis was growing up, he wanted to be either a Major League Baseball player or a real estate developer. Politis is CEO of Greybrook Realty Partners, which partners with real estate developers to finance their projects, and a partner in Greybrook Capital, which comprises Greybrook Realty and a health division. Greenbrook is now approaching $15 billion in active real estate development. Greybrook founder Elias Vamvakas says Politis has turned Greybrook Realty Partners into one of Canada’s largest real estate asset managers. 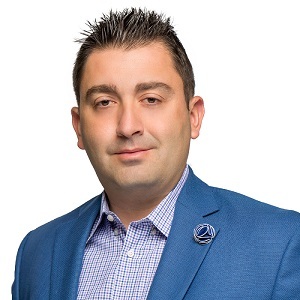 Politis, 35, was recently named one of Canada’s Top 40 under 40 honourees for 2018 – more than 20 years after Vamvakas received the same honour. Politis was born in Toronto but raised in Miami. While in high school, he worked at his family’s pharmacy, dispensing drugs and cleaning shelves. He returned to Toronto where he specialized in economics at the U of T and has been living in the city since along with the rest of his family. Ironically, Politis is the only person in his family who is not a licensed real estate agent. Although his parents are pharmacists and still own a pharmacy, their long-time focus has been real estate. His parents, sister and brother-in-law make up one of the top 15 teams in the country for Re/Max All-Stars Realty in Markham, Ont. After Politis graduated, Vamvakas offered him the opportunity to join Greybrook in a new venture. “We started the real estate division, and it seemed like a perfect fit for me.” He eventually earned “a little bit of equity and then a lot of equity” and is now a co-partner in Greybrook Capital with Vamvakas and Sasha Cucuz, a former minor-league hockey player. The real estate business has grown from obtaining investments by friends and family to having 5,000 active investors in 32 countries. Politis says a unique aspect of Greybrook is that it can create diversified private equity real estate portfolios for investors since it offers a variety of investment opportunities. Investors can inject a minimum of $25,000 per project. In contrast to REITs, Greybrook investors “get to pick the developer, the location, the type of property you own – whether it’s luxury condo in Yorkville, land development opportunities in Kleinburg or Oshawa or condos on the waterfront or a luxury condo in Miami,” he says. Greybrook is presented with about 200 legitimate projects per year and typically partners in 10 to 18 projects annually. Greybrook Capital partner Cucuz calls Politis “a consummate dealmaker” who is at the heart of the company’s real estate transactions. Aside from playing baseball in his spare time, Politis golfs and is active on the board of directors of the Blu Genes foundation, which focuses on advancing gene therapy for diseases. He travels extensively with his wife throughout Asia, Europe and South America. Greece, Amsterdam, Dubai, Seychelles, Maldives and Milan are some recent destinations. Thailand also beckons, for the opening of a Waldorf Astoria hotel. Now that Greybrook Realty Partners has invested in more than 50 real estate projects, Politis is hard-pressed to name a favourite. Real estate developments “are like children,” he says. “I love them all equally and I get mad at them equally at different times. For me, it’s more about understanding what the opportunities are in each project.